Five U.S. military aircraft crashed over a period of less than a month beginning in mid-March 2018, killing 16 crew members and alarming military officials. 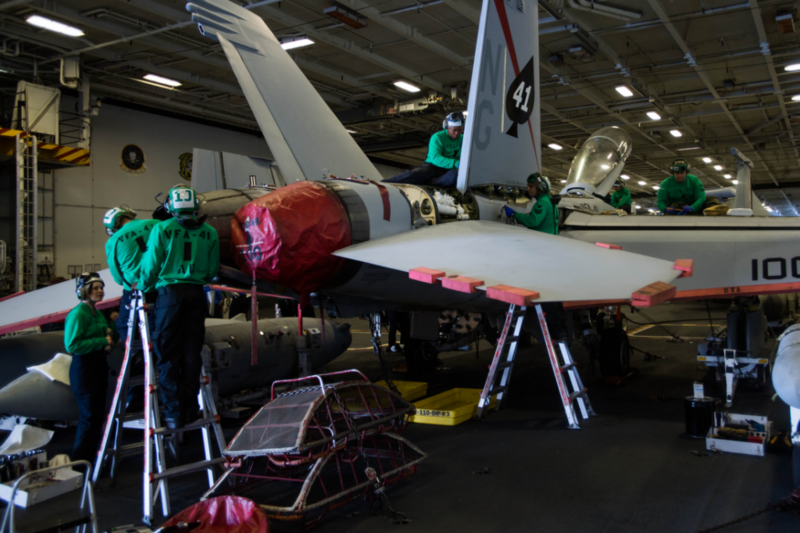 Two of the crashes involved U.S. Navy and Marine Corps aircraft, underscoring concerns that the naval aviation fleet is overworked, undertrained and poorly-maintained. “We’re at the breaking point on stressing the fleet,” Vice Adm. Bill Merz, the Navy’s deputy chief of naval operations for warfare systems, said at a symposium in Maryland in April 2018. The spate of crashes began on March 14, when a Navy F/A-18F Super Hornet fighter plunged into the sea near Naval Air Station Key West in Florida. Both aircrew died. On March 15, an Air Force HH-60 Pave Hawk rescue helicopter struck the ground in western Iraq, killing all seven airmen aboard. On April 3, a Marine CH-53E Super Stallion transport copter crashed in California. All four crewmen perished. The same day, a Marine AV-8B Harrier attack jet fell from the sky over Djibouti and an Air Force F-16 Fighting Falcon fighter crashed in Nevada. The Marine pilot safely ejected. The Air Force pilot, a member of the Thunderbirds demonstration team, died on impact. Two Army aviators died on April 6 when their AH-64E Apache attack helicopter went down near Fort Campbell, Kentucky. The quick succession of mishaps belies the underlying official statistics. For the Army, the rate of “Class A” air accidents, costing $2 million or more or in which someone dies, has held steady since around 2012. For the Air Force, the rate of Class A accidents has actually declined in recent years. But for the Navy and Marines, Class A mishaps are going up. Marine aircraft suffered five Class A mishaps in the 2014 fiscal year, eight each in 2015 and 2017 and 10 in 2017. The 2018 fiscal year was only halfway over as of April 2018, and yet the Corps had already racked up three Class A air accidents. Navy aircraft were involved in 15 Class A mishaps in 2014, nine in 2015, seven in 2016, 10 in 2017 and six in the first half of the 2018 fiscal year. When it comes the minor accidents, the statistics are even grimmer — and not just in the maritime branches. The biggest spike involves Class C incidents, which costs up to $500,000 to repair or lead to injuries serious enough to cause lost workdays. The Air Force recorded 667 Class C mishaps in 2017, a 16-percent increase over their 2012 low. The Marines suffered 40 Class C accidents in 2013 and a staggering 69 in 2017. Likewise, a spate of Class C incidents drove up the overall Navy accident rate no less than 82 percent over the last five years. Perhaps not coincidentally, in 2017 Navy warships were involved in two fatal collisions that killed 17 sailors, combined. Officials blamed long, frequent deployments and budget cuts. The 2011 Budget Control Act, which conservatives in Congress demanded from then-president Barack Obama in exchange for raising the U.S. government’s debt cap, sliced tens of billions of dollars from planned military spending starting in 2013. The cuts forced the armed services to eliminate maintainer billets, curtail training and cancel depot maintenance. A year later in 2014, the spread of Islamic State across Syria and Iraq led to an increase in operational tempo for U.S. forces, exacerbating the maintenance problems. The Marines were perhaps the most stressed. In April 2016, Lt. Gen. Jon Davis, then the Marines’ deputy commandant for aviation, told the Senate that just 87 of the service’s 276 F/A-18 Hornets were flightworthy. Around 40 of the fighters were on deployment to the Middle East and the Western Pacific for airstrikes on ISIS and for patrols near China and North Korea. Another 30 F/A-18s belonged to basic-training squadrons. That left just 17 Hornets with which potentially hundreds of pilots could maintain their proficiency. “I am concerned with our current readiness rates, both in equipment and personnel,” Davis wrote in his 2016 report on Marine aviation. “Aviation, much like our ships, has been stressed over the last 15, 16 years, as we utilize them two or three times what our planned utilization was going to be,” Assistant Commandant of the Marine Corps Gen. Glenn Walters said at the April symposium. A boost in military spending under Pres. Donald Trump could begin to solve some of the maintenance problems. But it takes time to train new maintainers, plan additional training and cycle broken aircraft through depots. In the meantime, the Navy and Marines might have to decline regional commanders’ requests for forces, Walters said.